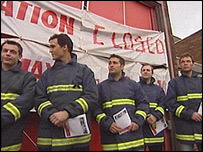 Firefighters have gone on strike in protest against planned cutbacks in Hertfordshire. Only 25 firefighters will be available during the eight-hour walkout compared to the normal staffing level of 120. The Fire Brigades Union said it was campaigning against "savage" cuts which it said involved the loss of more than 40 jobs. Hertfordshire Fire Service has said that no full time firefighters will lose their jobs under the plans. The county council said the strike, which began at 1400 BST, is the first where the Army is not providing back-up cover. The number of fire engines available has dropped from 43 to five full-time fire engines and five retained-crew fire engines as a result of the stoppage. Neighbouring fire services - Beds, Essex, Bucks and London - are likely to provide some back-up in areas bordering the county. Duncan Milligan, of the FBU, said the union's general secretary, Matt Wrack, and senior FBU members would be visiting fire stations in Hertfordshire during the day. Hertfordshire's Chief Fire Officer, Roy Wilshire, urged residents and car drivers to be extra vigilant during the walkout and to only dial 999 in a real emergency. "We will be very stretched," he said. Tony Smith, vice-chair of the Hertfordshire FBU, said: "Our lawful strike will only have a short-term impact compared to the long term impact of the cuts we are facing. "If Whitehall is experimenting to see what happens if there is no military cover then that is inexcusable. "The legal responsibility for providing emergency cover rests with the council." A spokeswoman for the Department for Communities and Local Government said councils had known since 2003 that the Army would not be providing cover and it was up to them to sort out contingency plans. Two further strikes are planned for 26 and 31 May.